This hotel is the charm of Chama! 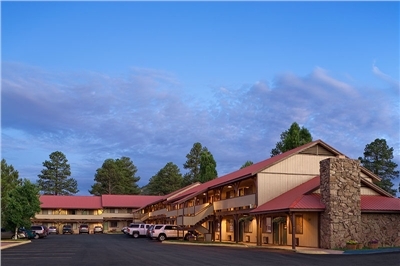 Nestled in the Rio Chama Valley at the Southern tip of the spectacular Rocky Mountain Range, the Branding Iron Motel welcomes you from May to October and offers the comforts of home delivered with exceptional Southwestern hospitality. 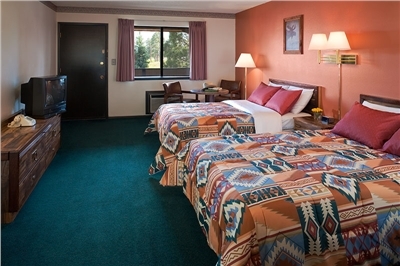 Each of the 39 spacious, comfortable, air-conditioned guest rooms are meticulously cleaned and maintained. 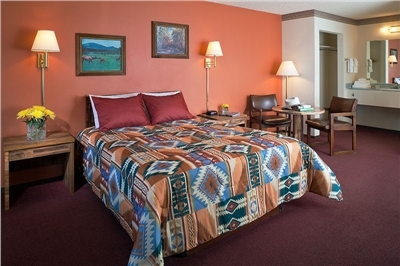 Located right near the Cumbres and Toltec Scenic Railroad station. Comfortable guest room with two full-size beds, accommodating up to four people. 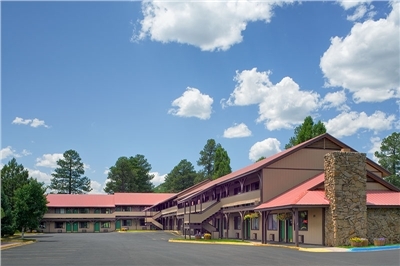 Amenities include air conditioning, cable TV with HBO, complimentary wireless internet access, in room coffee service and daily housekeeping service. 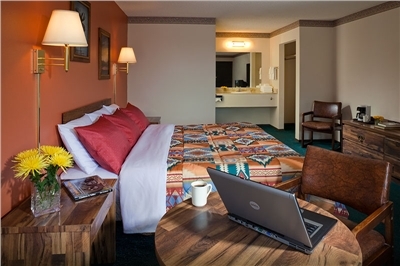 Spacious room with king-sized bed, daily housekeeping service, in-room coffee service, wireless high speed internet access. Comfortable room with one queen-size bed, suitable for one or two people. 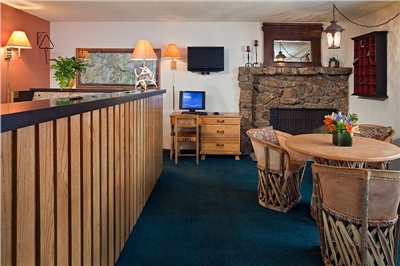 Amenities include air conditioning, cable TV with HBO, wireless internet access, complimentary in-room coffee service and daily housekeeping service. Cancellation	| All reservations must be canceled not later than noon 3 days prior to arrival. As an example, if you are scheduled to arrive at 6:00 PM on Friday, your reservation must be canceled not later than noon on Tuesday. If you do not comply with the cancellation policy, your credit card will be charged one night's room and tax. Please be aware there is a 7 day cancellation policy for arrivals between August 6 and August 9, 2009. Additionally, there is a 7 day cancellation policy for arrivals between September 12 and October 11, 2008. Cancellations for these dates must be received by noon, 7 days prior to your scheduled arrival. As an example, if you are scheduled to arrive at 6:00 PM on Saturday your reservation must be canceled not later than noon the previous Saturday in order to avoid a one day cancellation fee. 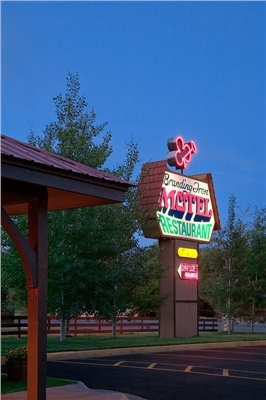 The Branding Iron Motel's office is open daily from 6:00 AM until 10:00 PM. If you plan to arrive after 10 PM, please let us know so that we can make arrangements for your check-in. The Branding Iron offers a minimal number of smoking rooms. If you wish to reserve a smoking room, please contact us. A maximum of two small pets, under 40 lbs. each, is permitted in our guest rooms. A fee of $10 per pet per night will be applied to your bill. Please advise the Front Desk at the time of check-in that you are traveling with your pets. Pets	| A maximum of two small pets, under 40 lbs. each, is permitted in our guest rooms. A fee of $10 per pet per night will be applied to your bill. Other	| All reservations must be cancelled not later than noon 3 days prior to arrival. Please be aware there is a 7 day cancellation policy for arrivals between August 6 and August 9, 2009. Additionally, there is a 7 day cancellation policy for arrivals between September 12 and October 11, 2008. Cancellations for these dates must be received by noon, 7 days prior to your scheduled arrival. The Branding Iron Motel's office is open daily from 6:00 AM until 10:00 PM. If you plan to arrive after 10 PM, please contact the motel so that they can make arrangements for your check-in. A maximum of two small pets, under 40 lbs. each, is permitted in our guest rooms. A fee of $10 per pet per night will be applied to your bill. Please advise the Front Desk at the time of check-in that you are travelling with your pets.